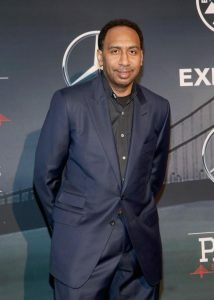 NBA analyst Stephen A. Smith was the featured speaker for the Charlotte Touchdown Club on Wednesday, July 19th at the Sheraton Charlotte Hotel in North Carolina. He was a big hit with the crowd, as many east coasters remember Smith while he was covering the 76ers for the Philadelphia Inquirer a couple of decades ago. Smith discussed how broad the broadcasting industry is these days and shared a lot of different stories from the background of his career. In addition to that, he took a bunch of odd questions regarding various sports and athletes, and the audience truly appreciated his perspective on the entire industry as a whole. The ESPN commentator in regularly on a show called “First Take” along with Cari Champion and Skip Bayless. In addition to that, he also has a radio show in which he hosts called “The Stephen A. Smith and Ryan Ruocco Show on ESPN Radio New York 98.7 FM. Smith’s entire career didn’t just revolve around being in the media, but he was an American sports journalist and is a currently featured columnist for ESPNNY.com. Smith recently traveled to North Carolina to be the speaker at the Charlotte Touchdown Club earlier this month and he was a big hit. Not only was he able to keep everyone entertained, but he got to showcase some of the sports industry from his own view. If your company is interested in finding out availability and booking fees for a sports personality like Stephen A Smith or other celebrities for a Personal Appearance, Keynote Speech, Speaking Engagement or Fundraising Event, call us at 1-888-246-7141.